except he that had the mark or name of the beast or the number of his name. SATAN is a Fallen Angel, whose original name was LUCIFER -(Isa 14:12), which means LIGHT-BEARER, but after Lucifer's Fall from heaven, Lucifer was renamed by God as SATAN, who now rules in the 2nd Heaven (our skies/space) and is the arch enemy of both God and man. Satan/Lucifer is commonly known by many other names/titles, including: Devil (Mat 4:1), Dragon -(Rev 12:9); Serpent -(Gen 3:1); Angel of Light -(2Co 12:14); Accuser -(Rev 12:10); Adversary -(1Pe 5:8); Prince of the host -(Dan 8;11); Prince and power of the air -(Eph 2;2); the Wicked One -(1Jo 2:13); Lawless-One -(2Th 2:8); Deceiver -(Rev 12:9) and god of this world -(2Co 4:4), to name a few! This coming Beast will be a ﻿counterfeit Trinity﻿ consisting of Satan ~ (like God the Father), His Son the Anti-Christ ~ (like God's Son-Jesus Christ) and the False Prophet ~ (like God's Holy Spirit, as representative on earth), who will be a Religious Leader, that will introduce and endorse this coming NWO-Political Leader, known as the biblical Antichrist, Satan in the Flesh, who will have absolute rule on earth for 3-1/2 years. This coming Anti-Christ/Beast/NWO-Leader will proclaim to be God-Incarnate, the prophesied Messiah/Christ of the Bible and the Torah, the Mahdi of the Koran/Islam, and Maitreya of the New Age Disciples, the Ascended Master of the Bhagavad Gita and the messiah of the several other alleged sacred writings of history. He will institute and enforce this prophesied ﻿New World Order﻿ consisting of a One-World Government -(Rev 13:5), One-World Religion -(Rev 13:8), and a ﻿One-World Economy -(Rev 13:16-17) for 3-1/2 years. The Book of Daniel the Prophet reveals that when this Antichrist arises, technology and understanding will be far more advanced than we know it today! 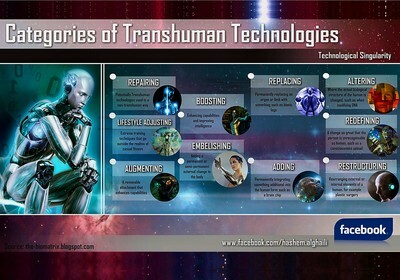 Genome Science of Humans and Animals will be mastered and used to clone other humans/animals, to create Human/Animal Hybrids and to mingle the seed of the Devil himself with the seed of mankind. 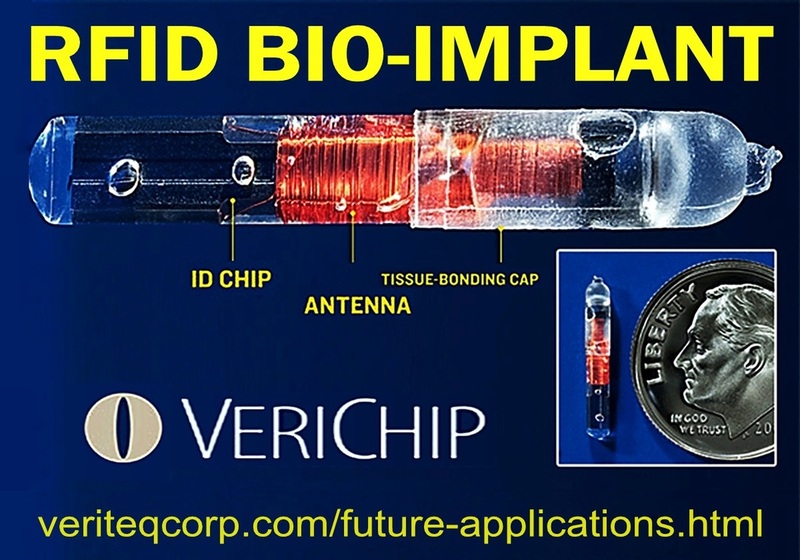 Today, in this 21st century of extensive travel & imploding knowledge -(Dan 4:12), many nations implant their citizens, military & government personnel with ﻿Bar-Coded Micro Bio-Computer-chips﻿ under the skins of pets, cattle, high profile persons, passports, senile Senior Citizens, including money, assets and etc. Don’t believe it? 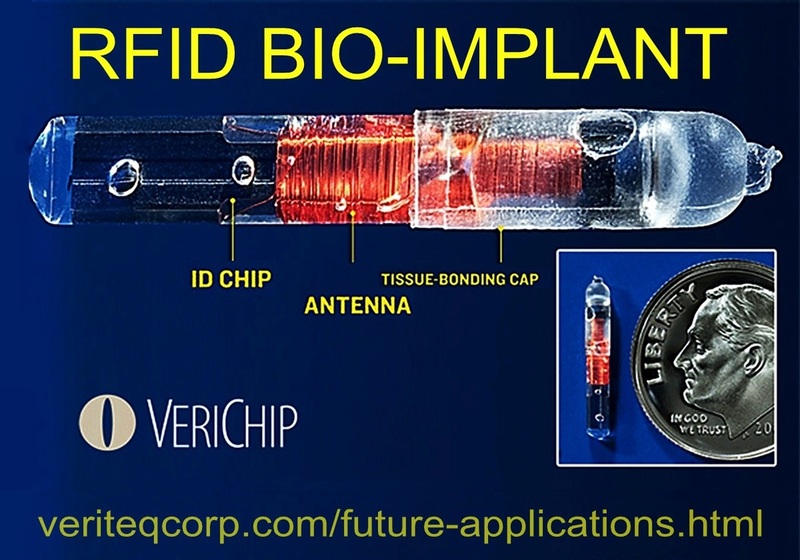 Please be sure to visit the following 4-links: veriteqcorp.com, micro-implant-wikipedia, epic.org/rfid and NY Times, once there, read, research and verify these articles for yourself. I have listed here above, just a few Biometric-ID Companies of hundreds world-wide, springing up in the last few years, since the turn of this century! 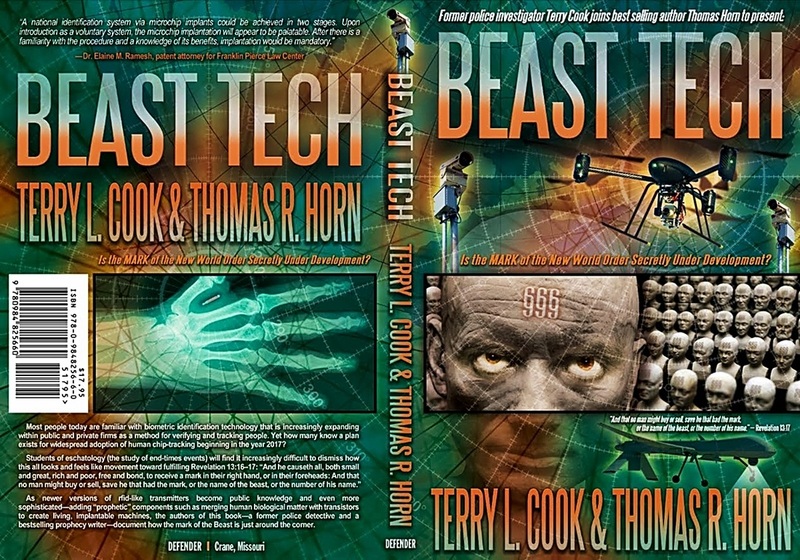 Through this coming Mark, this coming Beast and His Big Brother Government System will be able to track the movement & financial transactions of every human being on earth, ALL in the name of, “PEACE & SECURITY” -(﻿﻿﻿1Th 5:2-3﻿﻿﻿). This mandatory universal Mark will be enforced upon all, by this future World-Dictator biblically identified as "The Beast" also known as the "﻿Anti-Christ﻿" (﻿which means; another christ﻿). The tragic Terrorist attacks of 911 have played a prophetic role and provided a catalyst to this coming NWO-New World Order. As a result of and in response to the infamous 911 terrorist attacks in New York, all Governments around the world are scrambling to cater to the cries of their people, who are demanding of their respective governments to provide them with “Peace and Security” -(﻿﻿﻿1Th 5:2‐3﻿﻿﻿). 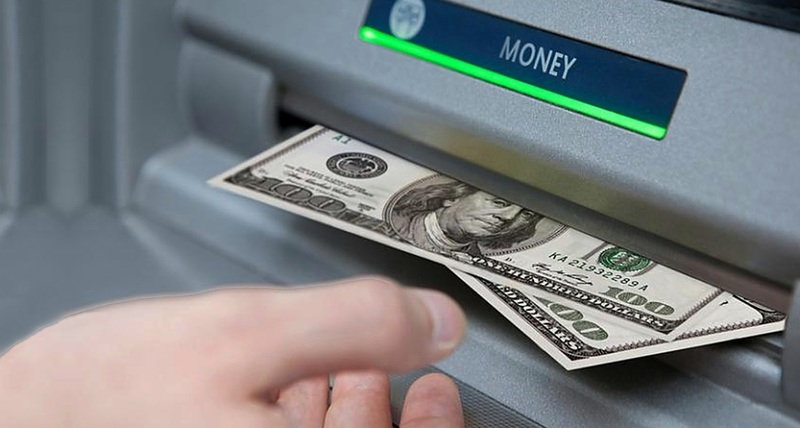 In order to maintain Peace and provide Security for the masses, Governments around the world will establish a future Cashless Society under the Leading of this coming Beast/Anti-Christ! This coming Anti-Christ will enforce His Mark into everyone’s Right-Hand or Forehead in order to buy and sell ALL goods and services on the planet -(﻿Rev 13:16‐18﻿). All Governments will eventually institute such a prophesied NWO/One-World Economic System, in the name of World Peace, to thwart the illegal sales and manufacturing of counterfeit money, drugs, weapons of mass destruction, to maintain global Order and to catch/prevent Terrorists and other criminal elements world-wide. 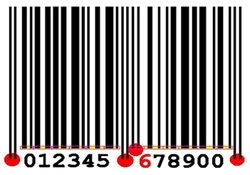 Economically speaking, there will be a UPC stamp on every item bought or sold, then scanned, like we see today at Supermarkets world-wide. 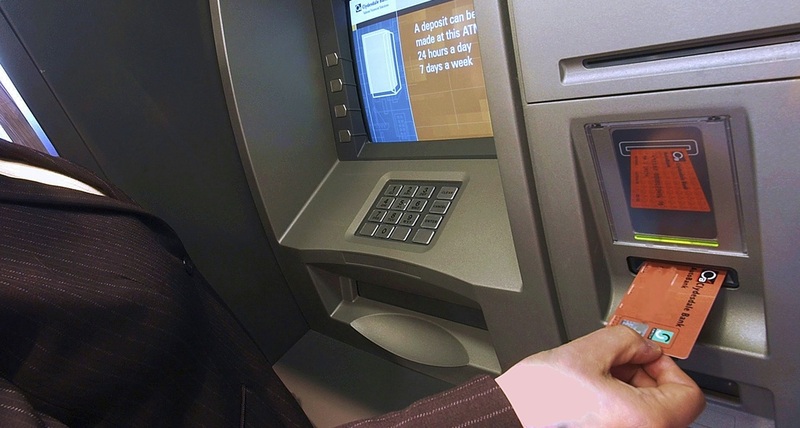 In addition however, to complete these future transactions, your Right-Hand/Forehead will be scanned electronically, transferring funds from your Bank Account into their Account. 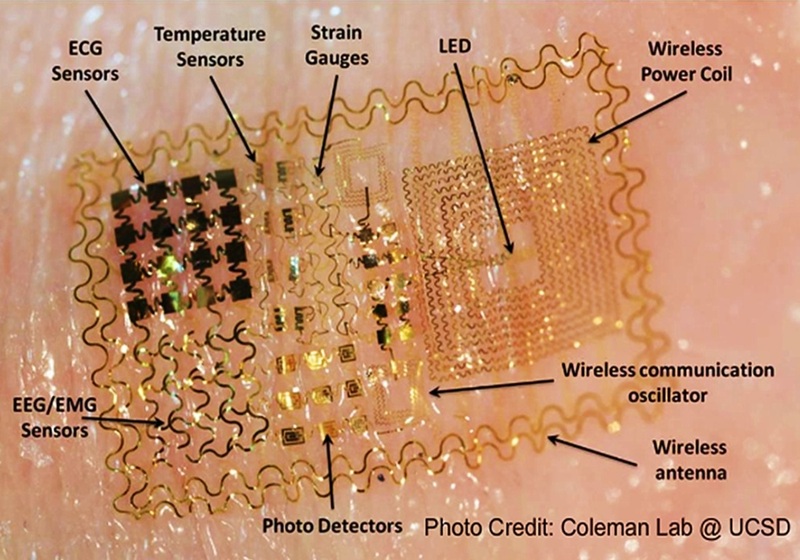 This Mark will store your ﻿Driver License Number, Biometric ID, ATM-Card, Bank Account, Medical History, Social Security Number﻿, and it will serve as a GPS Human-Tracking Device and so much more! -(Rev 13:16). ﻿Finally, this Mark will also facilitate a DNA HOST from the biological make-up of Satan himself. 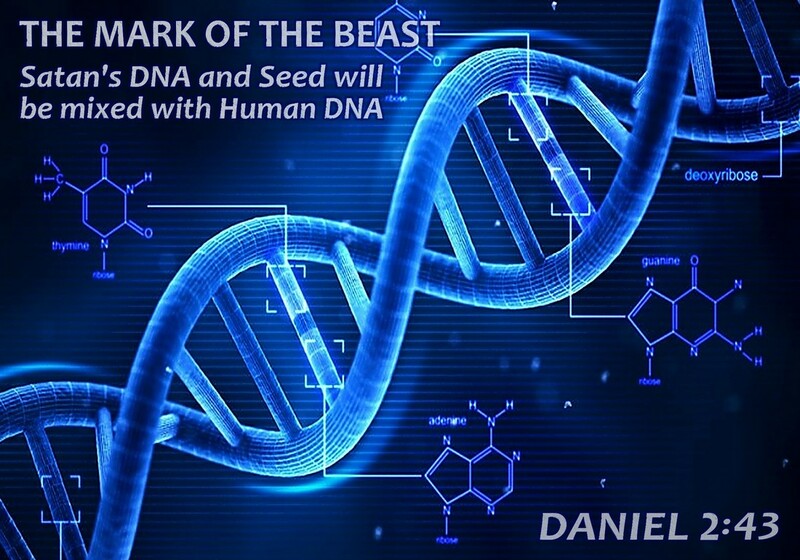 This fallen angelic DNA will be replicated within the human body, replacing, remaking and transforming human DNA into a HYBRID HUMAN/ANGELIC DNA, made in the IMAGE and LIKENESS of this coming BEAST, Satan in the flesh. Those who freely worship this coming Beast and receive HIS MARK, will gain ETERNAL LIFE, via another way, by transforming their Human DNA from mortal, frail, weak human beings, into immortal, more stable and supernatural human beings, who will not succumb to death, but those who willingly receive this Mark will first, succumb to painful diseases (Rev 16:2), possibly be attacked by weird genetically manipulated creatures -(﻿﻿Rev 9:6-11﻿﻿) and later ﻿suffer an eternal life of torment in the Lake of Fire﻿ as a result (﻿Rev 14:9-11﻿). Notice this allegorical real live event that took place in Daniel's day, when God transformed a Human King, named Nebuchadnezzar, into a literal BEAST, with feathers like an Eagle and claws like a Bird, who lived in the woods like an animal, eating grass like a cow, for 7-years, yet retained HIS KINGSHIP, then came to his senses afterwards and thus praised, confessed and acknowledged the God of Abraham, Isaac, Jacob and Daniel -(﻿﻿Dan 4:31-37﻿﻿). Just as this King was transformed from a HUMAN into a BEAST for 7-yrs, then later praised, confessed and acknowledge that God was the God of all other so-called gods, likewise, Satan (who wants to be god) and HIS SON, the HUMAN that Satan will use as the ANTICHRIST (who also wants to be a god), shall also be transformed from a pure HUMAN into the HYBRID IMAGE and LIKENESS of SATAN himself, by SATAN MINGLING HIS SEED -(﻿﻿Dan 4:23﻿﻿) with this HUMAN ANTICHRIST SEED, thus becoming a BEAST himself, like King Nebuchadnezzar did, that will RULE for 7-years, only later, to praise, confess and acknowledge from the Lake of Fire, that the God of Abraham, Isaac, Jacob and Daniel is indeed the God of all gods, after JESUS the REAL CHRIST defeats Satan, Antichrist & False Prophet, upon His return. 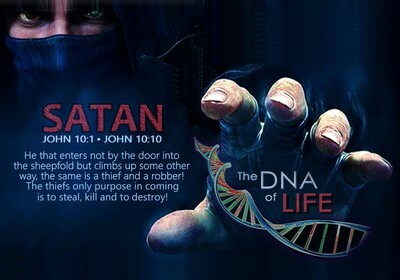 QUESTIONS: Why would anyone want to exchange their DNA for the DNA of the Devil himself? Would you willingly exchange your DNA for Satan's DNA if it gave you Eternal Life? When Jesus could grant you Eternal Life? Why would anyone not want to keep their own UNIQUE IMAGE and LIKENESS of God Himself and exchange such for the IMAGE and LIKENESS of Satan, an evil fallen angel? 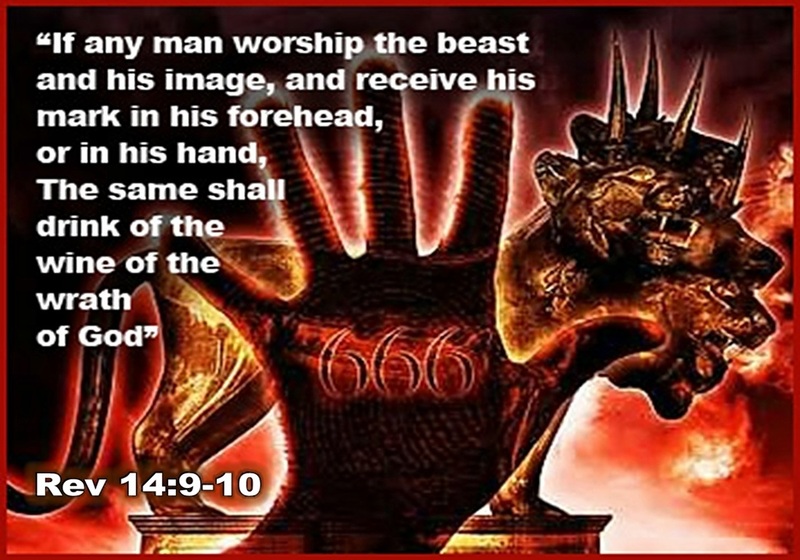 The next question we need to ask, regarding these weird looking demonic hybrid creatures, who ascend from the bottomless pit, is: Why are they attacking those who took the Mark of the Beast? They attack them, because they HATE BOTH SATAN and THOSE who FOLLOW SATAN, who TRANSFORMED THEM ALSO into BEASTS, just like SATAN transformed these weird looking demonic hybrid creatures into BEASTS, back in the DAYS OF NOAH, when Fallen Angels MINGLED their SEED with the SEED of the DAUGHTERS of MEN and most likely, with the SEED of ANIMALS/BEASTS of the earth, who gave BIRTH to these HYBRID DEMONIC CREATURES, called NEPHILIM, CYCLOPS, CENTAURS and more! But because Satan is NOT GOD and is himself a fallen and frail creature created by God, Satan will miserably fail, will not deliver on His promises to His followers and will be defeated at the coming Battle of Armageddon, at which point in time, Satan will be bound in the bottomless pit for 1,000-yrs, once Jesus returns! 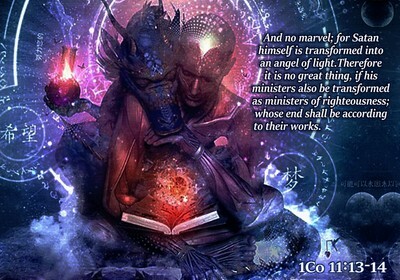 -(﻿Rev 19:19-21﻿ ﻿•﻿ ﻿Rev 20:1-3﻿). Jesus strongly alludes to the ability of both men and angels, in achieving the very impossible, even gaining Eternal Life, by "﻿﻿﻿sneaking in﻿﻿﻿" or by entering into the eternal Sheep-fold by "﻿some other way﻿", via theft, via technology, via discovery of scientific/biological matters of life and of aging processes -(Gen 3:22 • Gen 11:6 • Mat 22:11-12 • Joh 10:1 • 10:10). The big verse listed below (Joh 10:1 • Joh 10:10) is an important clue from Jesus, of how Satan will steal God's creation of and patent for eternal life and then pretend to present himself as the BETTER ALTERNATIVE, SAVIOR, CHRIST and GOD (anti-christ means = another christ) who can thereby, ALSO GRANT ETERNAL LIFE to those who will, like him, reject and deny God and His Son, the Messiah of the world, PUBLICLY, who willingly bow down and worship Satan as god, and who freely take his identifying Mark, which will IDENTIFY YOU AS BELONGING UNTO SATAN, as being re-made/re-created as a NEW CREATURE in SATAN'S IMAGE and LIKENESS, rather than becoming a NEW CREATURE (body-soul-spirit) in Christ Jesus - (2Co 5:17). 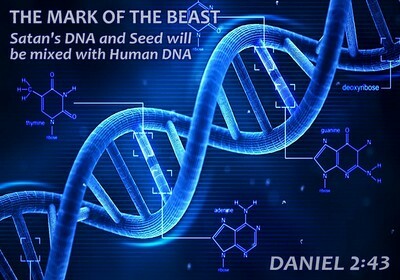 The receiving of such MARK will RE-CREATE our HUMAN DNA into that of an EXTRA-TERRESTRIAL DNA (angelic-human dna), after SATAN'S IMAGE and LIKENESS, by MINGLING HIS ANGELIC SEED (dna) with our HUMAN SEED (dna, which was originally created in God's image/likeness), thus enabling those who receive THIS MARK of SATAN, to gain ETERNAL LIFE via this OTHER WAY that Jesus spoke of below. But all who DENY JESUS and take this MARK to gain Eternal Life will be condemned as thieves, robbers and suffer eternal torment! Further, in light of this ability of both Satan/Man, gaining ETERNAL LIFE via ANOTHER WAY, first ponder how God sent an Angel with a flaming sword to Adam/Eve, thus forcing them out of the garden to prevent them from taking from the Tree of Life and forever staying in their fallen condition -(Gen 3:22-24), which is another reason why God later on, confounded man's one-language, saying; "﻿Now nothing which they have imagined to do will be restrained from them﻿"... God foresaw that Man was capable of discovering all there is to know about anything they put their mind to do -(Gen 11:6-8), like fly to the moon, clone animals and man, invent telecommunications, computers and more! Hence, God prevented man from rapidly continuing in knowledge by confounding their language! As a result of this language barrier, mankind spread throughout the earth, thus fulfilling God's original command to FILL-UP and MULTIPLY in the earth. Thus, it took mankind over 4,000-yrs, for all the various language groups to regroup and communicate with one language via the UN. 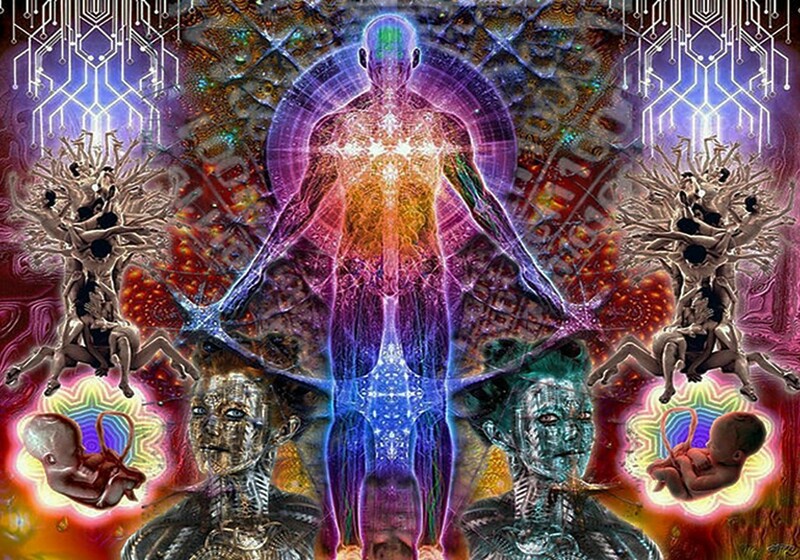 With all this information, understanding of scripture, history and modern scientific technologies of the day, which was prophesied in (Dan 12:4), is it too far fetched to believe, that man can also figure out the secrets to gaining ETERNAL LIFE by climbing up ANOTHER WAY, by NOT going through the DOOR and thus CHEAT DEATH, apart from going thru JESUS, who is the ONLY acceptable DOOR to Eternal Life, who calls Himself, the ONLY WAY, TRUTH and LIFE? especially with the help of Angels, who are much wiser than humans? Why would Jesus teach us that IF ANYONE CLIMBS INTO THE SHEEP FOLD SOME OTHER WAY, if that OTHER WAY was not ever possible? What then, did Jesus mean by saying ANOTHER WAY? Likewise, just as man can and has discovered various WAYS to splice, mingle and clone Human and Animal DNA together, thus creating freaks of nature, like the freaky creatures vividly described in Rev 9:7-10, so shall Satan, who is far more advanced in intelligence than man is, also splice, mingle and clone HIS DNA with HUMAN DNA, who will then proclaim to be our only true God, who became an Angelic like man, thus presenting himself as the Messiah and Savior of the world, offering all humans Eternal Life, declaring them as little gods, once they accept His Mark upon and INSIDE their bodies, by receiving Satan's image and likeness via the mingling of Satan's Angelic DNA with Human DNA. This ﻿Revelation 13:18﻿ prophecy above was written approximately 2,000-years ago! Likewise, this prophecy above, in ﻿Daniel 12:4﻿, was written approximately 2,500 years ago. Both of these prophecies were ﻿written long before the Computer was ever invented﻿. In fact, not only do we see Computers running the financial world in which we now live in, as prophesied, the very first PC-Personal Computer was sold to the public by APPLE COMPUTER COMPANY in 1976! Not only does the name APPLE eerily represent the ﻿forbidden fruit eaten by Adam and Eve﻿, the cost for the very first PC was sold for $666 and .66-cents! A mere coincidence you say? Really? Read on . . It gets better! 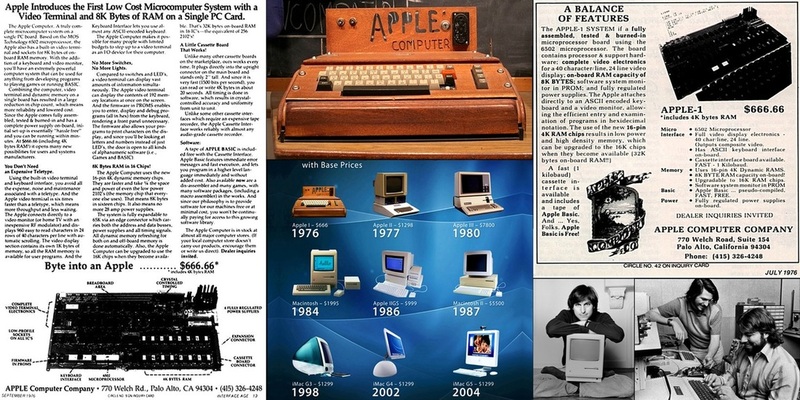 For HARD-PROOF that the 1st APPLE COMPUTER sold for $666, see original Newspaper Ads below... And if you still don't believe, scroll down to VIDEO and listen to the INVENTOR of the 1st Apple Computer, say so! This Rev 13:18 Prophecy below was originally written in Ancient Greek and Hebrew at the time. The Ancient Greek, as ALL other ancient languages, like the Aramaic-Roman-Hebrew and other languages, did not have numbers, but used letters of their own Alphabets, to represent numbers (ie, Roman letter “V”=5 and “X”=10). Similar alpha-numeric equations are very often utilized inside the fields of Math, Biology and Science Disciplines, such as; Algebra, Biochemistry, Calculus and more! For example, consider Albert Einstein’s famous alpha/numeric equation of: E=Mc2. Hence, the Alpha-Numeric Chart below has been derived by applying these Alpha-Numeric traditions, governed by a Scriptural Mathematical Equation as mandated in verses 17 and 18 below, which reads: . . . calculate the number of the Beast (666) . . and . . the number of his name . . and . . the number of ﻿﻿a man﻿﻿ . . . which is (6). According to Gen 1:26-31, mankind was created on the 6th-Day. Hence, the number (6) represents the number of man, and (666) is the number of the Beast (world leader known as Anti-Christ and his political system). 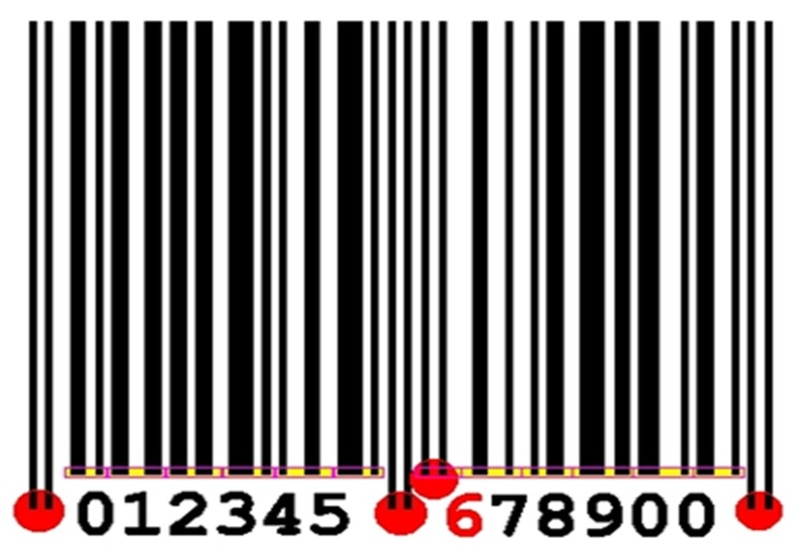 Since (﻿6﻿) is the Biblical number for man, and (666) is the number of the Beast, we have taken the English Alphabet below and have assigned Numerical Values to each letter of the alphabet, by calculating multiples of six to each letter as outlined below and mandated by scripture: (A=6 • B=12 • C=18 etc). Note: To understand Alpha-Numeric Chart below, read verse above, then ﻿Calculate by adding 6 to each letter of alphabet below﻿, as instructed by this scripture verse above! 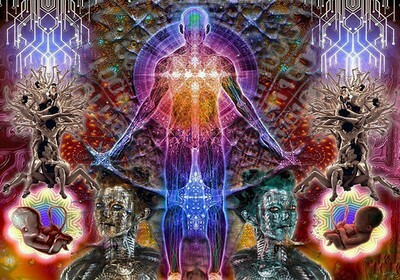 That's right, the COMPUTER, BIO-IMPLANTS and this coming NWO consisting of a One-world Government, One-world Religion and a One-world Economy, were foreseen by the Apostle John over 2,000-years ago, revealed unto John by Jesus himself, so that WE (here in the future) would be timely prepared and duly warned of this evil to come, a time of tribulation, that will try all those upon the earth! You may think that this above display is just a coincidence or a lucky guess by the Apostle John. But just you wait right there, keep reading and you will see! There are more eye-opening ﻿﻿﻿alpha-numeric equations﻿﻿﻿ coming below, that are sure to bulge your human eyes from your head. 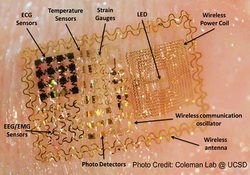 As we have read, the scriptures reveal that one day; Buying and Selling will only be possible by having this Mark of the Beast (micro-chip computer) implanted into one’s right hand or forehead. All future Buying and Selling will be impossible without the COMPUTER. 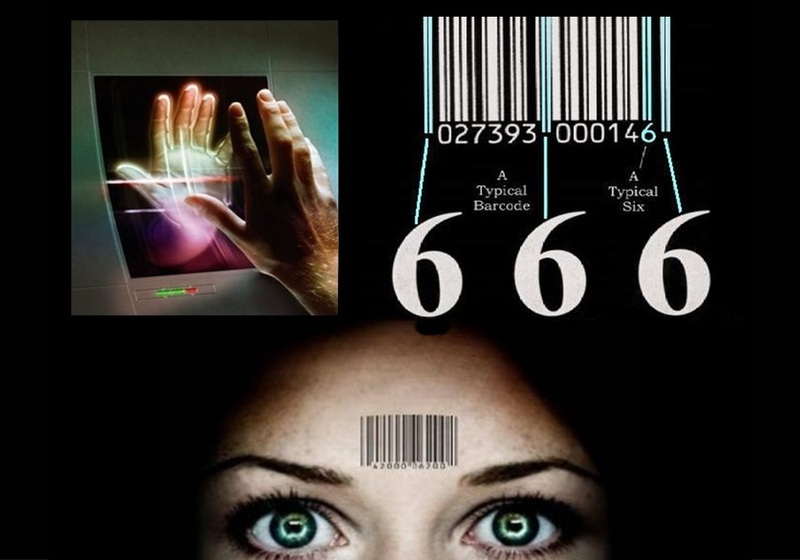 Records of every transaction will be recorded and stored by Internationally Linked Computers and will be easily accessed by Satan, the Antichrist, the false Prophet and other appointed Government Personnel and Agencies world-wide. Such mass global record keeping could only be possible by a Global Society that operates its Economy with SUPER-COMPUTERS that are globally linked, one to another! Such a Super-Computer exists today and currently operates the (EU)-European Union. The EU Economy records and stores its financial data, via (EFT)-Electronic Fund Transfers. 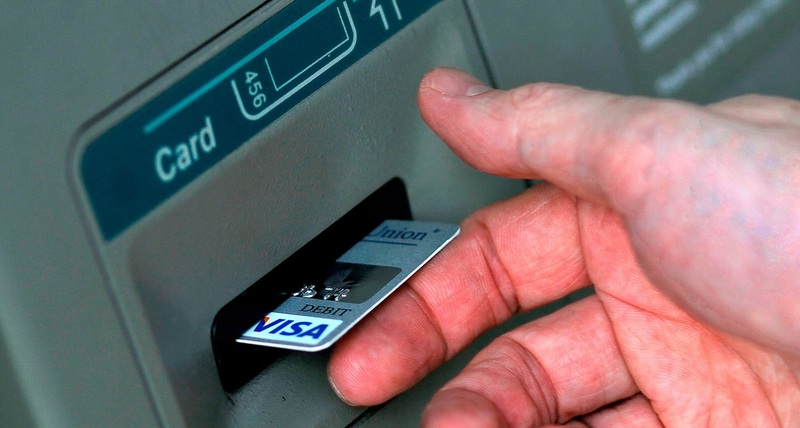 Everyone in Europe, who purchases by Credit/Debit/ ATM-Bank Cards, have all their data from such transactions, stored into this massive Computer Data Bank located in Brussels, Belgium. 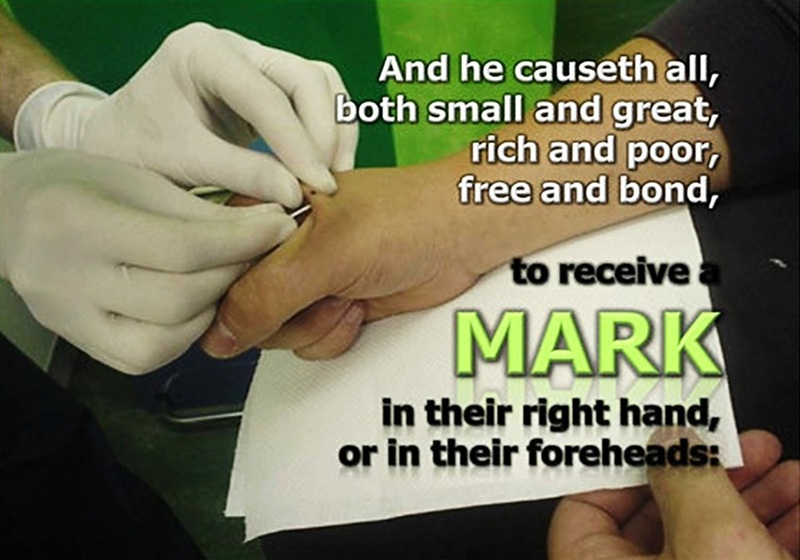 NOTE: The Bible reveals that such a Mark will be placed ‘IN’ the Right Hand or ‘IN’ the Forehead. The eyeball is located ‘IN’ the forehead. 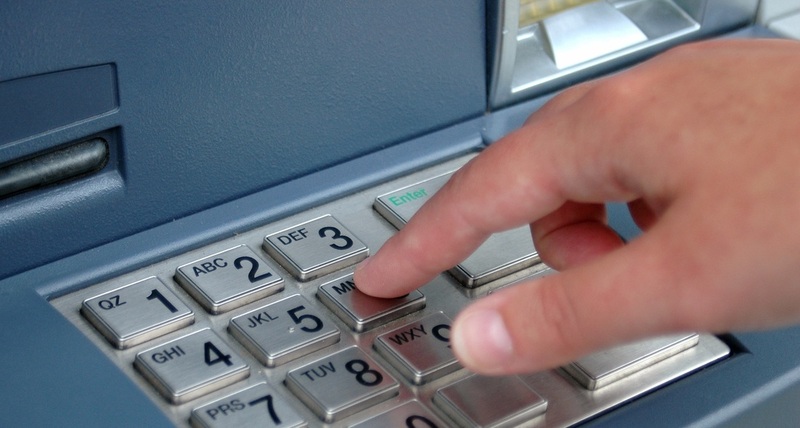 Whether you are Right-Handed or Left, which hand do you use when operating an ATM-Machine? 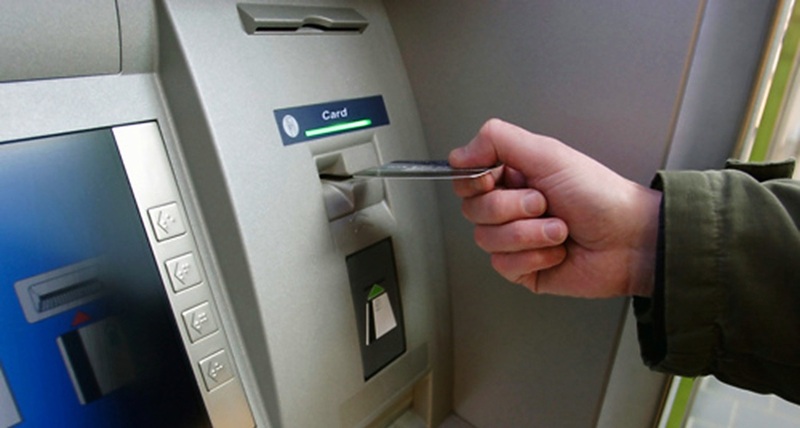 ATM’s visually instruct its users to use their right hand when inserting Cards into the Machine. 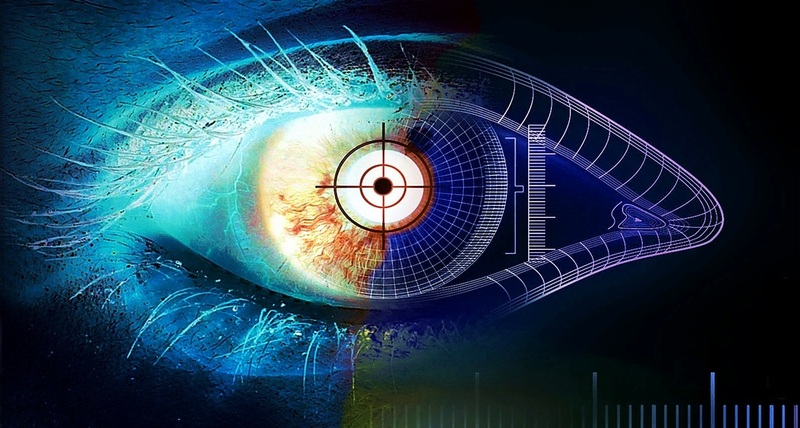 Currently, to enter High-Security Areas within our Government, certain Financial Institutions and/or Armored Bank Vault Areas, the Right-Eye must be scanned for clearance and passage into restricted areas! Are we being groomed to use our right-hand and/or our right-eye for all future buying and selling transactions world-wide? Yes, we are indeed being groomed and prepared as prophesied. 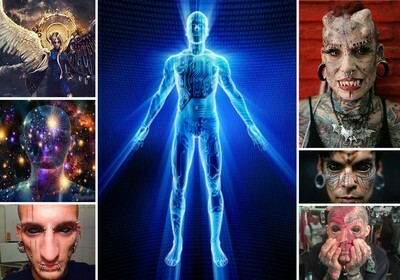 This prophesied NWO-Big Brother Beast is indeed upon us! It is not coincidental that the nick-name/symbol for New York is the ﻿BIG APPLE﻿? 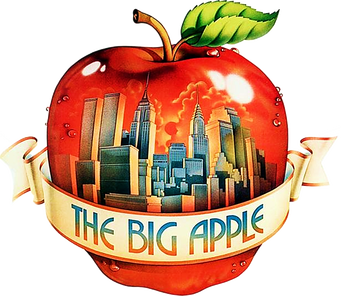 New York’s official symbol is a “Big Apple with a bite taken out of it". Although the Bible does not mention the specific type of fruit eaten by both Adam and Eve, when contemplating the nick-name, "Big Apple", doesn’t forbidden fruit come to mind or ring a bell? Because of its huge ports, New York is also called, the “Cross-Roads of the World”. All these Organizations listed above have heavily vested interests in and play aggressively active roles in promoting a One-World Government, One-World Economy and a One-World Religion. ﻿The 666-Building﻿ (﻿see pic below﻿) is an Office Complex in NYC and can be seen from Rockefeller Center. This building mainly holds Offices for Government/Business Agencies, International Banks and Major Computer Companies from around the world. Coincidental? 911 Wake-Up Call From God Almighty!